Down, down, down. 10yr-3mo at 0.86% at 2pm today. See Jim’s post for more on the spread. Figure 1: 10 year-3 month Treasury spread (blue), and 10 year-2 year Treasury spread (green). Source: FRED, and Bloomberg for 7/2-7/3 and author’s calculations. 7/3 observation for 2pm Eastern. 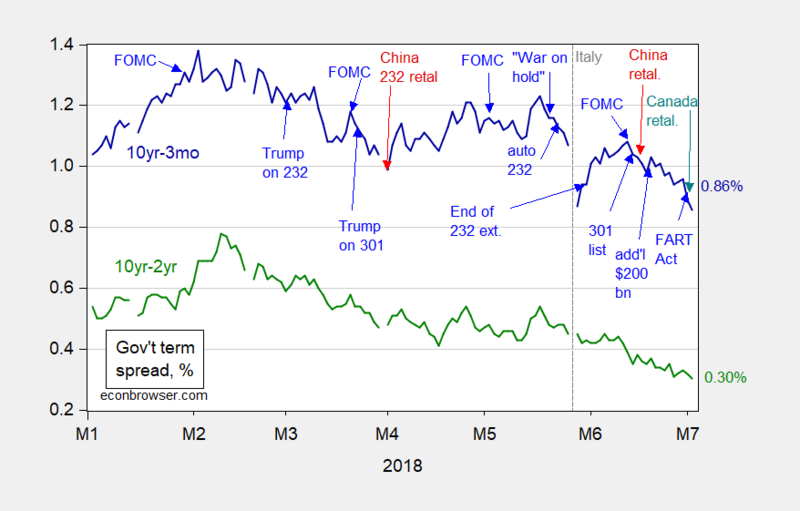 [H]ow [could] these trade actions could impact the macro economy[?] The threat and/or imposition of the tariffs could have potentially significant positive effects on GDP by lowering imports, but these effects would most likely be swamped by various negative effects if the tariffs are actually implemented. 1. Rising prices depress consumption. The tariffs would raise the prices of imports of metals and autos from a number of countries and imports from China more broadly. The overall effect on US prices could be magnified if domestic or other foreign producers take advantage of the opportunity to raise their own prices. We estimate that the tariffs listed above could raise consumer prices in the US by about 0.6%. This increase in prices would depress real household income and consumer spending by the same percentage. With consumer spending accounting for 70% of GDP, total GDP would be depressed by more than 0.4%, offsetting most of the gain from reduced imports. 2. Retaliation depresses exports. Europe and Canada have already retaliated proportionately to the metal tariffs, others are in the process of doing so, and China has promised to raise tariffs on US exports if the threatened US measures are imposed. …raise negative impact on exports to 0.2% of GDP. If a 20% tariff on US imports of autos was matched abroad, as could be expected, US exports could be depressed by another 0.35% of GDP, bringing cumulative losses in US exports to about 0.55% of GDP. 3. Rising protectionism and declining world output depress confidence and hit financial markets. Many of the above are mere projections, and estimates. 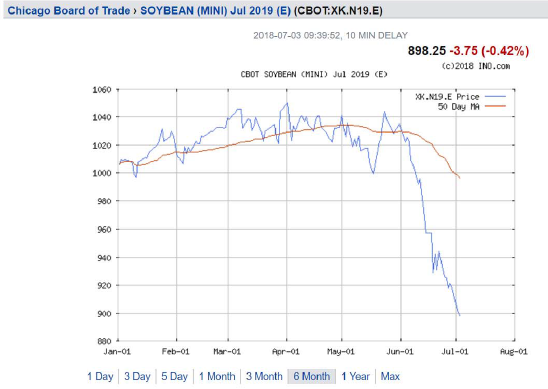 We can already see some concrete manifestations of the impact of trade policies and trade policy uncertainty on commodity prices — in particular, nearly one-year-ahead soybean futures (expiring July 2019). Planting plans and weather conditions right now should not directly affect output a year from now, so that trade policy effects should dominate. Carry costs should drive a wedge between actual and futures prices, but econometric work (Chinn and Coibion, 2014; Reichsfeld and Roache, 2011) suggest that futures are unbiased predictors of future spot prices, and smallest RMSPE among typical time series models. Now, contemplate the evolution of futures prices over the period corresponding to that in Figure 1. Source: ino.com, accessed 7/3/2018, approx 2pm Eastern. This entry was posted on July 3, 2018 by Menzie Chinn. I was trying to find the song on Youtube for that old weekend ag show that aired on Iowa Public TV. “Fly with me…. blablabla……… fly with me blablablabla” NO not the Sinatra song. so should be subsidize the soybean and other commodities and producers who are hurt in this trade war? it is rather surprising all the critters on this site have nothing to say about this chart. corev (cliff claven), peakstupidity, eddie, bruuuuuce? the silence is deadening! come on losers, let’s hear you spin a new tail on these graphs. or do you stand behind your weather and the negotiations are not finished yet arguments? those graphs gave you nothing more than a [email protected] slap in the face, pardon my french.